The Gaiia Vegan The Obvious Scented Surgras Soap is made with the method "cold saponification" to bring even more softness to the skin. Rich in glycerin and vegetable oils, it maintains the skin's moisture and preserves it from drying out. Its fragrance is a subtle blend of the floral notes of Himalayan lavender and the herbaceous scent with the spicy connotations of the holy basil. He invites us on a journey to the top of the mountains of India. An important symbol in the Hindu tradition, holy basil is considered a plant that brings wealth, health and prosperity. 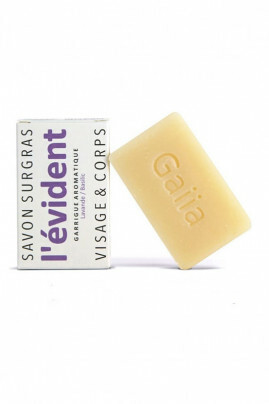 The Gaiia Vegan The Obvious Scented Surgras Soap seduces us with its creaminess and aromatic fragrance! Gaiia Vegan Surgras Soap for incredibly soft skin! Ecological, you can use it as soap (face and body), shampoo, make-up remover, beard soap! Because of its softness, the Gaiia Vegan The Obvious Scented Surgras Soap respects all skin types. A traditional method of cold saponification and natural ingredients! Sodium Olivate, Sodium Rice Branate, Sodium Cocoate, Aqua, Glycerin, Sodium Castorate, Fragrance *, Limonene, Linalool.